Product #60591 | SKU Ki Pro Go | 0.0 (no ratings yet) Thanks for your rating! A deposit of $600.00 is required for this pre-order. 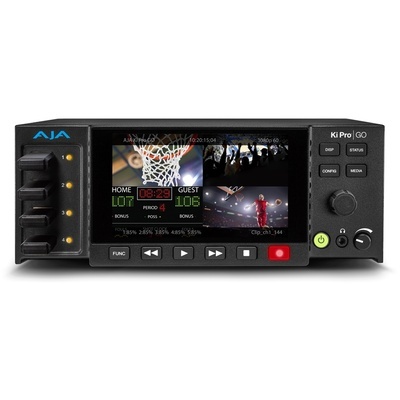 AJA Ki Pro GO Multi-Channel H.264 Recorder and Player is a portable multi-channel H.264 recorder and player offering up to 4-channels of simultaneous HD and SD recording to off the shelf USB drives with redundant recording capabilities. 4x 3G-SDI and 4x HDMI digital video inputs with flexible channel assignments provides connections to the latest video sources, including cameras. Incoming video sources can be mixed and matched, via Ki Pro GO's Genlock free recording capability. High quality 2-channel embedded audio or balanced XLR analog audio can be assigned to any recording channel. Multi-Channel Matrix Monitoring enables multiple video channels to be viewed on any single HDMI display. Record 1, 2, 3 or 4-channels of HD or SD up to 1080p 50/60 in H.264 simultaneously with Ki Pro Ultra GO. Simplify your setup by connecting up to four HDMI and four 3G-SDI source cables into Ki Pro GO and assign any combination of four inputs at a time for four channels of H.264 recording to the four USB slots on the front of Ki Pro GO. Ki Pro GO allows independent profile support per channel for recording; up to 25 Mbs at 8 or 10-bit for any channel assignment depending upon your delivery need or eventual bandwidth allocation for the file's playback stream. You can also choose between 4:2:0 and 4:2:2 color depth. Four USB ports on the front provide easy to access recording media using off the shelf USB drives. A fifth USB port on the rear provides redundant recording of all channels simultaneously, either for backup or pass on of a secondary copy of captured files to postproduction, clients, or others on your team.